Wang-Chiew Tan, assistant professor of computer science, has received the National Science Foundation's most prestigious award for new faculty members from the Faculty Early Career Development (CAREER) program. The award will support her work investigating foundational techniques and developing tools for tracing the flow of data in networks of evolving databases, such as financial data warehouses or scientific databases used in bioinformatics. These techniques and tools could be used, for example, with genomic or proteomic databases that organize and archive data from various sources. Tan traces the provenance (origin) and flow of data across databases by reasoning about its movement. The reasoning involves inter-database relationships that are often described by high-level abstractions, such as schema mappings. Tan is also designing and developing data annotation systems based on provenance. Annotations travel along with the data as it is transformed, allowing access to information about the data's source and quality. One product of this research will be an archiving toolkit to manage evolving databases in a semantically meaningful way. 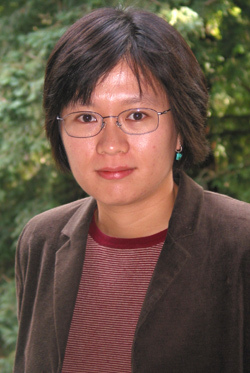 As her research progresses, Tan plans to integrate it into an advanced database topics course to be taught at UCSC. She plans to make the course materials, publications, and software available on the Internet. CAREER awards recognize the teacher-scholars who are the most likely to become the academic leaders of the 21st century. The awards support creative career-development plans that integrate research and education and build a foundation for a lifetime of contribution.